The Schulman Grove Visitor Center is right before the paved part White Mountain Road turns to dirt. It’s a very obvious turn—I believe there are even signs. The trail climbs very gradually for the first mile, taking you past the ruins of former lead, zinc, and silver mines and associated cabins. I took my time and enjoyed the hike, looking at the ruins and enjoying views of the Eastern Sierras. At about the 1-mile mark, I left the trail to head straight up the hill to the peak. It was steep, but manageably so. Before long, I was up on the summit. There appeared to be another peak about 50-100 yards away that may have been slightly higher, but this north peak was the one designated for SOTA, so I set up my SOTABeams dipole and got comfortable. With a marginal cell signal, I was able to get a self-spot out on the SOTA Goat app, and get down to business. I had a great time completing 6 QSOs on 20m, then another 3 on 40m. I didn’t go back the way I came, since I wanted to see more of the Ancient Bristlecone Pine Forest. 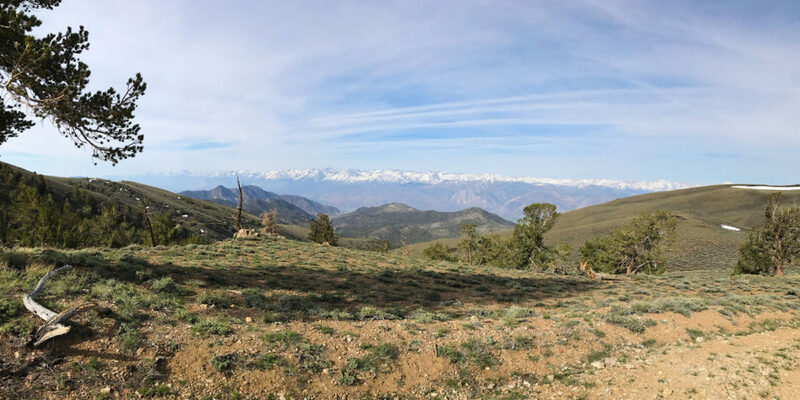 I went along the summit ridge to the north, and descended down to the east side of the ridge back onto the trail, which took me to the Methuselah loop trail. What an amazing place! Unfortunately, I didn’t get many still photos. I mostly have video, which you can see by clicking on one of the images above.